It’s garage sale time again! The Annual St. Ann Garage Sale begins on Saturday, October 23th. We are in need of usable items to sell so go ahead and free up some square footage in your house by bringing your tax deductible donations to the Parish Center starting Sunday, October 17th at 1 PM until Thursday, October 22nd 7 PM. Please remember pick up your tax-deduction form on the bar counter. You are twice blessed if you put your donated items where they belong in the Parish Center! 10/24 at 1:00 to box and bag up leftovers for charities and perhaps take a van or truckful up to Value Village. Thank you in advance for helping us out! St. Ann Catholic School was chosen as a project site for the UMSL Martin Luther King, Jr. Day of Service. A group of 7th-8th grade students provided free babysitting supervised by a parent volunteer. A team of 30 St. Ann School teachers, parents, students, and parishioners arrived in the morning of Monday, January 18, 2010. They got busy cleaning the halls, stairways, Science Lab, and cafeteria. 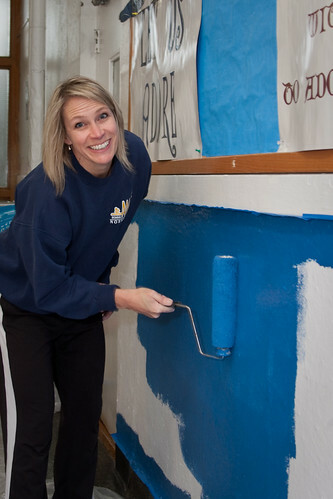 They painted walls in the main hallway, the 5th grade classroom, and the 4th and 5th grade stairwells. They scraped paint in the cafeteria and repainted those walls. An UMSL team of 7 volunteers arrived after noon with lunches for our 30 school volunteers and paint for the Science Lab and the cafeteria. The UMSL team painted the Science Lab and helped to clean the cafeteria. An enormous amount of work was accomplished! Mark your calendars for January 17, 2011. We will be asking for volunteer help from parents and students for the 2nd annual event! We hope to be chosen as an UMSL project site again next year, too. Below are some photos taken during the Day of Service.